The Solar-Powered Roadway From San Fran to L.A. 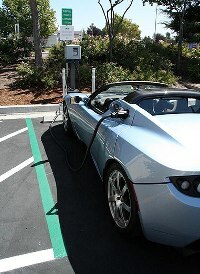 The future is here, and it is electric-powered. That’s what the makers of the Tesla Roadster all-electric car believe, and now for California’s fans of the Tesla, they can drive from Los Angeles to San Francisco and back while keeping their cars charged. Rabobank and SolarCity have combined their efforts to launch five electric car-charging locations along the famous Highway 101 with two in San Luis Obispo and one each in Salinas, Atascadero, Santa Maria, and a soon-to-be-open location in Galena. While four of those are on the standard electricity grid, the station in Santa Maria is solar-powered, which means the car of the future can also charge with the energy of the future. While the chargers only work with the Tesla now, plans are to retrofit all locations with universal plugs in six months’ time, so that other electric cars can get a taste of that sweet, free electricity. If there’s one good thing you can say about California, it’s that they’re usually on the forefront of trends. In this case, they’re the leaders in an important trend. Rolling this kind of infrastructure is going to be expensive, and most places won’t give away electricity for free, but maybe the future solution is a battery-swapping station in current gas stations, kind of like how you can trade in an empty propane tank for a fresh one for a nominal fee. If you could make the batteries condensed, I think it would be a brilliant idea.